A-HOTEL.com - Luxury and cheap accommodation in Sasani, Albania. Prices and hotel, apartment booking in Sasani and surrounding. Bunec Relax Apartments is set in Piqeras. Free WiFi is offered. Situated in Piqeras in the Vlorë County region, Holiday Home Ali features a terrace. It has barbecue facilities, a garden, sea views and free WiFi. Set in Piqeras, Vila Xhorxh Bitri features accommodation with free WiFi. Fitted with a terrace, the units feature a TV and a private bathroom with a hair dryer. Situated in Piqeras, Spiropali provides air-conditioned rooms with free WiFi. Featuring luggage storage space, this property also provides guests with a terrace. Boasting a garden and free WiFi, Xuxi Apartments is set in Lukovë. Every room has a balcony. Set in Piqeras, Villa Bianca offers accommodation with free WiFi and TV, as well as barbecue facilities and a garden. All units come with a terrace with sea views, a kitchenette with a fridge, and a private bathroom with shower. Joni's house offers air-conditioned rooms in Piqeras. Among the various facilities are a garden and a terrace. Set in Gjashtë, Bunec bed and breakfast provides accommodation with a flat-screen TV. Complimentary WiFi is available. Facing the beachfront in Piqeras, Alushi GuestHouse features a garden and a terrace. Every room has a balcony with a mountain view. Set in Lukovë, 23 km from Sarandë, Lagjini Oil features barbecue facilities and free WiFi. Guests can relax in the garden at the property. Set in Piqeras, Villa Riza Veliu features free WiFi. All rooms feature a kitchenette and a private bathroom. Set in Piqeras, Hotel Hyso Vela has barbecue facilities and a garden. Boasting a 24-hour front desk, this property also provides guests with a terrace. Piqeras Relax Guest house in Piqeras features barbecue facilities and a garden. This 3-star guest house features free WiFi and a terrace. Offering a terrace, a bar, free air conditioning and free private parking on site, Hotel Itaka is located in Lukovë. Free WiFi access is available in public areas. Located in Piqeras, Garden Vila Veliu offers accommodation with a terrace, kitchen and free WiFi. All units feature air conditioning and a cable flat-screen TV. Let Rooms Lukova is offering accommodation in Lukovë. Featuring a 24-hour front desk, this property also provides guests with a restaurant. Lagji Eduard Apartament provides accommodation in Lukovë. Guests can make use of a garden. Situated in Lukovë, Melina's House provides accommodation with private terraces. All rooms feature a flat-screen TV with cable channels and a private bathroom. Hotel Vila Kafe features a seasonal outdoor swimming pool, garden, a terrace and shared lounge in Lukovë. Every room comes with a balcony with sea views. 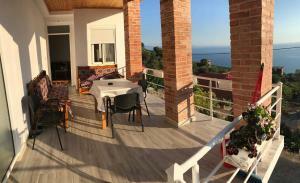 Situated in Lukovë in the Vlorë County region, Evita's House offers accommodation with free WiFi. There is also a kitchen in some of the units equipped with a toaster.